Nexus Journal is the periodical publication for the Ten Worlds setting. 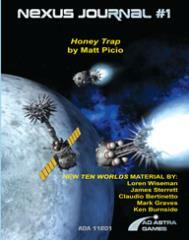 Each issue brings additional ships for Attack Vector: Tactical, fiction, setting and background details on the Ten Worlds. In Volume 1, you will find the Astrographica account of a Schwarzvaal transect, Honey Trap by Matt Picio, the Mansur class keelgun cruiser, and the FN Redoubtible class missile corvette. In addition to this, you will have a preliminary rule for short period (planetary) orbital mechanics, tactics submitted by players like you and two pieces of fiction!